A friend of ours, Marty Conlisk, moved to Sacramento a couple of years ago or so to live with his sweetheart, Laura. Thanks for hosting us, folks. Awesome! Marty used to be the videographer forLabor Beat, here in Chicago. He would come back to town to visit his kids and pop in for a visit. He said he would arrange for a prisoner art show in Sacramento, once he got with the art community there. That sounded cool, but a lot of people say they will do a lot of things and basically, hardly anyone ever follows through with much of anything. Marty proved to be for real! I had done a show at Multi Kulti, an activist gallery, and organized a roundtable discussion the next day with several Chicago prisoner support groups. M K took the initiative to photograph the many pieces of artwork. In fact, two ‘rads came down to my house and filmed my complete collection and put it all on a disk, which I sent to Marty. He ran it by Colin Swift, who with his wife, Lauren, run Lilac Neuron Media. It is hard not to be enthralled with this stunning artwork. It is another thing altogether to one, interest a gallery for an actual showing and two, figure out a way to pay for it to happen. Colin & Co. figured out how to do both! He contacted Matt Brown, who readily agreed to host the show at his gallery, Exhibit S, which is located at the downtown mall in Sacramento. Next, Colin put together a terrific kickstarter video weaving samples of the artwork with a strong pitch he made, spliced with comments I had said, during a video skype we did earlier. We met our fundraising goal of $1,800, so my comrade, Mike Ploski, and myself could fly out there and put on the show and have money to print, promote and otherwise pay for what needed to be done. Special thanks goes out to Twitch from Central Texas ABC who popped for $500, basically ensuring that the show would actually happen. Others pitched in to help us, most especiallythe ‘rads from Sacramento Prisoner Support, Jenny, Petey and Lynne. Beer and wine and cheese were supplemented by hearty fare from Sacramento Food Not Bombs. A three-piece jazz combo, which Marty dubbed “Hotsky to Trotsky” mellowed out the show with their jams. It created a serene sort of brainstorming! The show ran from January 11 to 26. The room itself was maybe 25 feet by 25 feet with a separate wall about 15 feet long. A three-foot wide swath of black surrounded the white walls, basically at eye level. This is where we placed the artwork, in two or three levels, artistically placed, with each artist having their own area. Some artwork was anonymous and they had their own section. Several pieces from Cali death row prisoners were donated by attorney Dennis Cusick. Peter Werbe from the excellent, long-standing anarchist journal Fifth Estate responded by offering for exhibit 4 wonderful paintings by Marie Mason, the witch-hunted green activist given 22 years by this incarceration-mad government. She also had a little table of literature about her case. This included a bundle of the latestFifth Estate. We had a massive table with dozens of different zines, with a whole section of literature from Cali prisoners. I put a comprehensive, 64-paged zine together, entitledREASON 4 OUTRAGE, which fleshed out the stories of these prisoner writers and artists, along with my address, many quotes and other goodies. Sacramento Prisoner Support had a table, too. In another room nearby, two video projectors flashed shots of the artwork on opposite walls at different intervals. This allowed you to see the artwork on the big screen. With so much detail in these intricate drawings, this was very helpful, indeed! It was a multimedia extravaganza! Zines were sold at $1 per ounce and artwork, both original and print, was also available for cheap sale. During opening night, several people spoke, including Colin, Marty, Jenny, Mike and myself. A special treat was the appearance of Eugene Dey, a former three-strikes prisoner, who I had not heard from in a decade. He had written insightfully about the three-strike insanity that I had crafted into zines. He has since done terrific work, helping other recently released folks get situated. He spoke, too! It was like seeing a long-lost Brother! I did radio interviews, such as Sacramento’s KKHI Community Happenings show and podcasts (Which Side and American Dream Interviews) along with an enormous amount of outreach, both during the kickstarter campaign and leading up to the show, which has continued. This type of painstaking networking pans out later, as personal and working relationships are forged, whether you ever even meet face-to-face. Solidarity and mutual aid are vitally needed and enthusiastically welcomed. The local free weekly,Sacramento News and Review printed a well-worded paragraph about the upcoming show. Folks started coming by during the two days we set up the show. They were stoked and went back to tell their peeps! Posters were put up around town. We were very clear about it. I was impressed by the fearlessness and focused effort from the art community and everybody around for going to bat for this “dangerous” type of show. Minor hassles were sloughed off. On with the show! Prisoners from all over the country stepped up their game and sent artwork and statements that we read at the show, along with some letters. For this terrific artwork is a form of mutual aid, along with the wonderful writing, research and comradeship our incarcerated Brothers and Sisters are able and willing to provide. 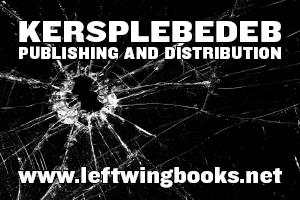 They often pay a horrific price for their courageous, insightful and seminal work to help us write and enliventhese awesome publications that form the heart of this free school anarchist-driven educationalproject we have given ourselves the responsibility to actualize. It is really true. These relationships we have built with these people are often stronger than the ones we have with our own family members. It means the world to them to have their work published and read by fellow prisoners, far and wide—and to be included in the struggle on the “outs.” In fact, my main goal with all this was to help energize people into doing more involved support work with prisoners, get their work known in wider circles and ratchet up the struggle. For the prison struggle is ground zero, here in this incarceration-crazy country, and the strongest thinkers and doers are also, all too often, the most locked-down and oppressed. This is where hard work gets done! So, that is what we did and from this show, more such shows will happen. I have been invited to present at theFifth Annual Law & Disorder Conference to be held from May 9 to 11 in Portland, OR. I am pitching such shows at other venues, such as the upcomingAllied Media Conference in Detroit in June. Sacramento Prisoner Support will do a show in June, as well. Art and lit are like peanut butter and jelly—good alone, but great together! Before I give a thumbnail sketch of the prisoners involved, I also want to mention that Colin had the foresight to have the opening night show and artwork videotaped. His wife, Lauren, edited it all into a powerful DVD that captures the fullness of this artwork and literature. Also, Lynne Perry hand-printed (in chalk) the names and addresses of the prisoner artists on the wall, next to their work. She also wrote out statements about the prisons in any bare spots available, which made the showing very complete. Matt Brown said it was the most attended show ever at his gallery! People identify with the real deal. 16 years, published their work and, mostly, gotten it back into the eager hands of their fellow captives. It is a mutual effort to educate and empower people—on the inside, first and foremost, but also for those on the “outs.” I am retired from my wage-slave job, so I can do more outreach with this material to people in “minimal” security. After the response from theMulti Kulti show, where hundreds of mostly Polish people really got off on the artwork (it is located in a Polish neighborhood in Chicago), I realized that combining artwork with literature was the way to go. People are captivated by the artwork and are thus more likely to pick up a zine and learn the “brutal truth” and, hopefully, get involved. So, hereare some words about these amazing artists and writers. The most extensive collection was created by Todd (Hyung-Rae) Tarselli. He had a whole wall to himself, including several mind-searing originals. We have collaborated on several projects of his work, some of which we did not even present at this show, so extensive is his archive of achievement. He generously donated all this work, including original oil paintings of Assata Shakur and Marilyn Buck! He is a protege of the great Russell Maroon Shoatz. His work has graced many a publication. Kevin “Rashid” Johnson is the most powerful political artist in the world! Perhaps equally important is his contributions as a revolutionary writer and strategist. He is the Minister of Defense for the New Afrikan Black Panther Party—Prison Chapter. We presented a small sample of his art and several of his writings I had crafted into zines. He has been menaced and whisked away from Virginia to Oregon and now Texas. He is a modern-day George Jackson and people deserve to learn from his life and his brilliant art and analysis. California prisoner artist, Richard G. Hall, Jr., was also well-represented at the show. His caricature,Vern, is an ongoing one-frame comic that really captures the injustice, pathos and outrageous problems young Black males must deal with to tortuously navigate this racist, classist system. His work and his wisdom are spreading and, I think, he will soon be paroled! Another prolific Cali artist (and writer) is Jose Heladio Villarreal. His focus is on the Aztlan people—those whose traditional home is Northern Mexico, which is now part of the U.S. Southwest due to imperialist expansion. Who are the real “illegals?” His work is very colorful and he writes about the Mexican struggle here in the United States. He was also one of the hunger strikers in the strikes that exploded through the Cali gulags into other states! Another terrific artist is Larry Pendleton. He did a lot of artwork for his comrade, Coyote Sheff. Coyote has since been released. They teamed up for some truly sought-after zines. Coyote ran the only real prisoner ABC (Anarchist Black Cross) while incarcerated. Their influence on other prisoners spans the whole of the country. Others I would like to mention are Sean Swain, the brilliant anarchist writer and talented artist, who languishes in the super max hellhole in Ohio. Throughout his dreadful, life-long ordeal, he still has a surprising sense of humor and overflowing originality and militancy. His writings are legend! Another real hip artist is Brandon Begay, an anarchist Native prisoner in Arizona. He has a punk band called The Violence. He drawsfantastic comic book type zines as well as excellent, useful artwork, bringing home basic anarchist beliefs. The cover on my 2013 catalog features his work, both on the cover and the back page. (The first six months, Rashid drew the cover.) Brandon goes by the name Bran Scam. There are many other artists and writers I would like to mention, but I will leave you with one—Mutope Duguma. He was one of the Pelican Bay Strike leaders, who I had worked on zines with for years. I had hoped to visit with him while I was in Cali, but they did not send the approval until I was already back home in Chicagoland. I covered the strike and his situation in the 64-paged zine about the show, which is available from my distro, along with hundreds of other zines and copies of all this artwork. Support these dedicated and brilliant prisoners. Write to them directly or to me and ask for a comprehensive catalog, sample zines, etc. We are not going to stop doing this—pouring forth with the modern-day literature of revolt! It is up to you to add your talents and interests into the mix. Get proactive and check out this awesome stuff! They’re in there for us, we’re out here for them!